25 Jul When a crisis occurs, who’s got your back? 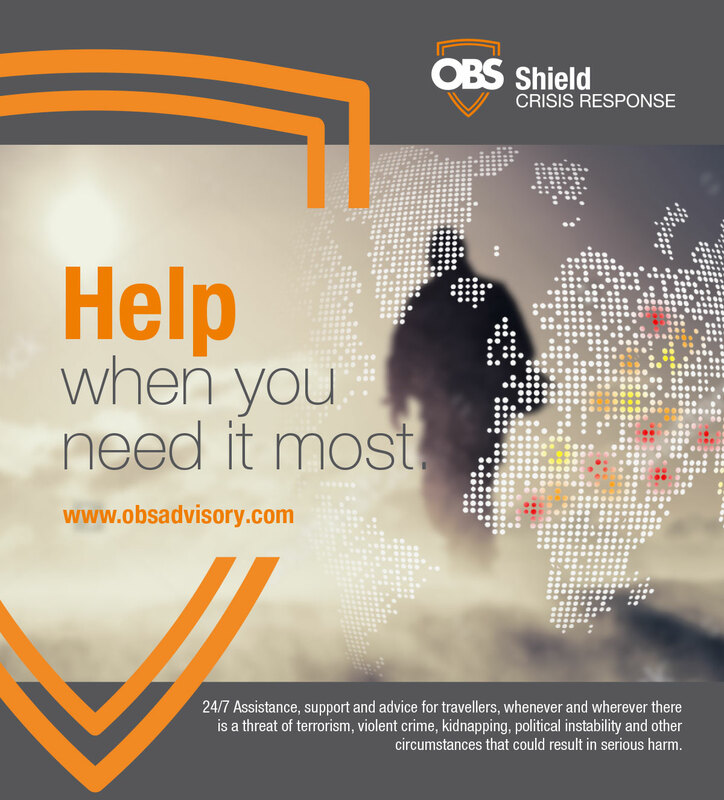 OBS Shield is a world-wide crisis response plan offering 24/7 assistance for travellers who may face elevated levels of risk while abroad. Tangiers Group operates in some of the world’s least hospitable regions. This means we’re well-acquainted with rapidly-developing crises stemming from political unrest, sectarian disputes, criminal activity and terrorism. To achieve our commercial and humanitarian aims, we work with some of the most skilled negotiators, risk assessors, medical professionals and security experts worldwide. In fact, there’s one principle which is clear to both our staff and partners alike: in an unpredictable world, you do not want to face these challenges alone. That’s why Tangiers Group decided to offer its expertise to the public. OBS Shield is a world-wide crisis response plan for travellers who may face elevated levels of risk while abroad. It offers 24/7 assistance to victims of violent crime, wrongful detention, mysterious disappearance, kidnapping, blackmail, extortion, political threats, hijacking, and acts of terrorism. These threats can all occur without warning and can cause serious bodily harm, detention or death. Assistance protocols have been formulated to cover as wide a range of potential crises as possible, meaning OBS Shield is as applicable to the security situation in Mexico as it is to Afghanistan. They also take into account the disparate sources of threats that travellers can face: criminal gangs, corrupt officials, insurgent groups, and political or religious extremists. Anyone can purchase OBS Shield, from journalists and humanitarians operating in conflict zones to professionals conducting business in regions beset by high-crime. Membership is also available for groups of 10 or more travellers, meaning larger organisations can provide peace of mind to entire teams. In the event of a crisis, you may feel events are spinning rapidly out of control. The advice from OBS is simple: find a safe place, make sure you’re physically okay, notify the local authorities, if practical or possible, and, finally, call us. OBS provides a dedicated phone number you – or a representative – can call in order to speak to the consultant service provider. A trained and experienced crisis expert will be on hand to assess the situation thoroughly, to reassure, to advise, to coordinate security resources and to liaise with third parties where applicable. For more extreme incidents, response consultants may be deployed to the physical location. Due to the potential risks of coercion during a crisis, clients can even use a simple code to communicate their well-being – or otherwise – to our service provider without fear of aggravating a situation. OBS Shield covers several crucial costs associated with crisis management. These may include fees and expenses of security guards, emergency evacuation costs, legal expenses, fees and expenses of an independent interpreter, relocation travel and accommodation costs and fees for emergency medical care incurred within 12 months of the covered crisis. This expertise and cover means our clients can take advantage of the principles we’ve operated by since the Group was founded in 2006, protecting themselves, their family members or their employees from the worst that an unexpected crisis can throw up. It also means that wherever you are in the world, and whatever the risk, someone has got your back.